With no artificial colors, flavors, or preservatives and kitchen-level ingredients like Guajillo chilies, mozzarella cheese, and chicken and beef raised with no antibiotics, tonight's meal is a no-brainer. 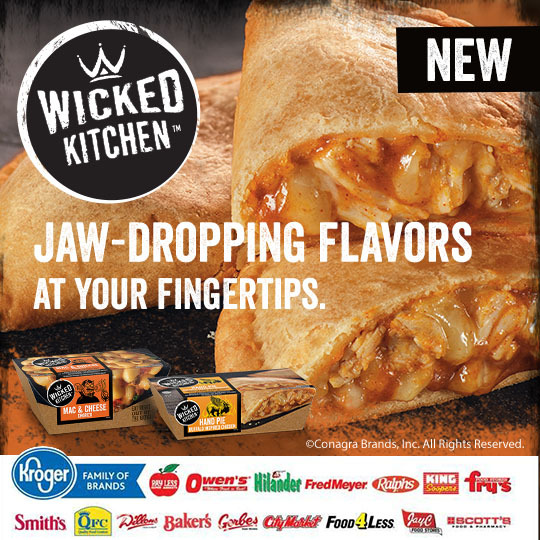 And now, for a limited time, there is an online offer to save $1.00 on any ONE (1) Wicked Kitchen Mac & Cheese or Hand Pie at Smiths and Kroger banner stores! Click here to download this awesome deal before it's gone. And while you're shopping at your local Smiths or Kroger banner store, don't forget to stock up on all of the mouthwatering meals, from the Buffalo Inspired Chicken Hand Pie to the Chorizo Mac & Cheese. With these jaw-dropping flavors at your fingertips, you may never have to ask yourself, "So what's for dinner?" again. Make sure you follow Wicked Kitchen socially to stay up to date on future promotions and check out the brand here for more information on this good food with a bad-itude. I don't generally use frozen meals at home, but I do often have them for a quick after school snack for my son. These sound like a great option the next time we shop! I love how they contain no artificial colors, flavors or preservatives! thanks for such a great insight, these look like a great idea for the freezer! Anything that can make meal time a little easier as well as nutritious - I'm all in! Great freezer ready meal! This looks really good. IT definitely looks like something my son and husband would love to try. I have never heard of these before. I think they would be a big hit with my kids. I haven't heard of this brand yet. They look like they would be great for a quick meal when you are in a rush and they look like they are much more bold and flavorful than some of these types of frozen meals can be. First time I heard of this brand but I like the sound of wicked kitchen. I hope they have it here in my area. Oh yes I definitely need help sometimes with the evening meals! I've not heard of this before. Something to look into and compare budget. Oh wow Wicked Kitchen looks so good. These prepared meals would be so handy on those busy nights. I love these Wicked Kitchen meals. Plus such a great deal with the coupon. I have never heard of this line before! I cannot wait to look for them and try them out! I love quick and easy dinners and saving money with it is a great bonus! I can't wait to try them.